Flybe flight BE331 diverted to Belfast International Airport, Northern Ireland. The aircraft, a DHC-8-400, landed there with the nose landing gear retracted. The flight departed Belfast City Airport about 11:20 UTC, bound for Inverness. The crew stopped the climb at 4,000 feet reporting problems with their nose gear. The aircraft entered a holding pattern, while the crew was troubleshooting the problem, but they were unable to resolve the problem, the nose gear remained in an unsafe position (partly retracted) and could not be extended again. The crew decided to divert to Belfast's Aldergrove International Airport, where the aircraft landed safely on runway 25 about 2:05 hours after departure coming to a stop on its main gear and the nose. One person was taken to a hospital with minor injuries, the aircraft received substantial damage. 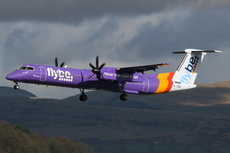 In a statement FlyBe said "Flybe can confirm that one passenger was taken to hospital with a minor hand injury following an incident involving one of our aircraft this afternoon... There are no further reports of any other passenger or crew injuries. There were 52 passengers plus one infant on board and four crew members." According to ground observers the aircraft's nose gear doors were open, however, the nose gear could not be seen obviously remaining locked up in the nose wheel well. On November 14th 2017 the AAIB reported that the nose gear failed to extend. The occurrence is being investigated by the AAIB.